In this, the first part of a three part audio feature, we look at the hotly debated question of whether the Irish War of Independence was really a communal or sectarian conflict as well as a struggle for national liberation. We do not pretend that this series will be the definitive answer to this question. It hopes only to shine a light on the discussion. In Part One, “Before the Revolution”, we look at whether British rule in Ireland was sectarian and look at the social and religious divisions in Irish society. We also pose the question of whether Irish nationalism and Republicanism represented a broad, national movement, or a Catholic communal ideology. Not everyone was a separatist in Ireland in 1919. 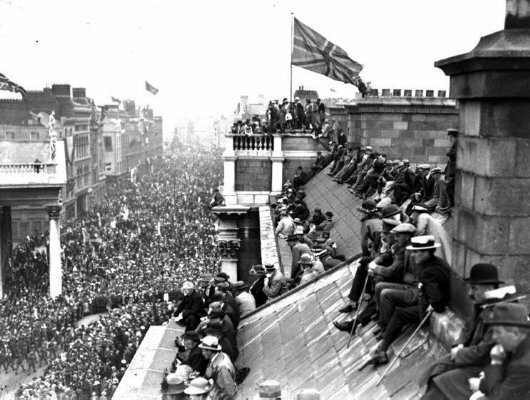 Here the Union Jack flies over Trinity College at the Victory Parade for the First World War in Dublin. The Contributors, in order of appearance are; Niall Meehan, Padraig Yeates, John Borgonovo and Fearghal McGarry. Questions by John Dorney. Niall Meehan argues that while British rule in Ireland was based on sectarian divisions and that Catholics were structurally disadvantaged, the Republican revolution cannot be seen simply as Catholic communal response. Rather it was a national movement that encompassed both Catholics and Protestants. Padraig Yeates and John Borgonovo, both with an in-depth knowledge of early 20th century Dublin and Cork respectively, describe sectarian, class and political divisions before the upheaval of 1916-23. What comes across is that while the Protestant Ascendancy may have been a thing of the past by 1900, Protestants still occupied a place at the peak of society in pre-independence Ireland. Moreover, Padraig Yeates describes how religious competion between the rival churches on the ground could be bitter -especially in Dublin. John Borgonovo goes on to talk about the influences on militant republicanism in Cork, which he argues was a vaguely defined but deeply held commitment to ousting both British Imperialism and the corruption of the Irish Parliamentary Party and its strong-arm the Ancient Order of Hibernians, in favour of a more egalitarian Republic. Fearghal McGarry, who has studied the Witness Statements of veteran Volunteers in the Bureau of Military History, as well as the War of Independence in Monaghan, cautions against dismissing the communal, Catholic elements of Irish nationalism in the period. While pre-1916 Republicanism was a determinedly non-sectarian and secular ideology, the same could not be said for the mass movement of 1919-1921. He argues that this movement contained several contradictory attitudes towards Irish Protestants, both often present at the same time, seeing them sometimes as fellow Irishmen and sometimes as pro-British enemies. On the ground in places such as Monaghan, where there were large Catholic and Protestant communities, he argues that communal divisions could be stark, with Catholics aligned with Sinn Fein andthe IRA and protestants supporting unionists and loyalist forces. Niall Meehan is the head of Journalism and Media Communication faculty at Griffith College Dublin. He has written extensively about the history and historigraphy of the Irish Revolution, including A Troubled History. Padraig Yeates is a journalist and author. He has written, Lockout: Dublin 1913, the history of the great Dublin strike of that year. He is currently public relations consultant to the trade union Siptu. Listen to previous interview with him here and here. John Borgonovo is an American-born but Cork-based historian. He has written, Spies Informers and the Anti-Sinn Fein Society, The Intelligence war in Cork City, 1920-1921, on the War of Independence in Cork city. He teaches at University College Cork. You can read a review of Fearghal McGarry’s The Rising here and listen to him talk about the Easter Rising here. 3 Responses to "The Irish War of Independence – A Religious War? Part I"